What a Bunch of Bastards! Last year my friend and colleague Adrian went to PDC 2008 and had a good time. Learned a lot too. He came back all enthusued about Windows Azure. "The next big thing !". Well I have been so involved with Silverlight, WPF and all things .NET 3.5 that I worried that a year would go by and I would miss the Next Big Thing. 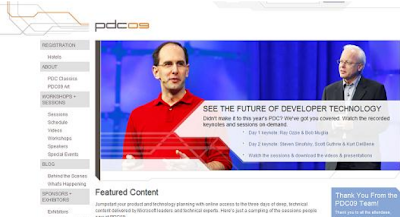 No sooner had Adrian returned and started writing a new Azure course than I had submitted a request to attent PDC 2009 (November 17th to 19th 2009). It was a little premature but it doesn't hurt to be first in the queue. I updated that request 6 months ago to include TechEd Europe 2009 (November 9th to 13th 2009) in Berlin as a plan 'B'. A circular was sent round the company saying that money was tight so it wasn't clear if anyone would be able to attend any conferences this year. I figured "fair enough" but raised the stakes by justifying the expense of sending a single person to a conference in terms of that person then delivering a series of "distilled/bitesize" presentations to colleagues as I worked around the country. The idea of staff presentations went down a storm and I delivered several on Silverlight. A few people caught the bug and there have been several events since. However, no word on the conferences. In late September I got a call from my friend Adrian. "They" thought it best coming from him. Apparently there were so many changes happening in Azure that Microsoft felt that Adrian should attend PDC 2009 in order to update his knowledge prior to a sheduled run of events that we will be running for them in the new year. What could I say? "Thanks for letting me know. I fully understand." Well I did understand and so although I was gutted, there really wasn't a problem. Time passes, as time does. There I was at my desk on the evening of 9th November watching the news from Berlin. 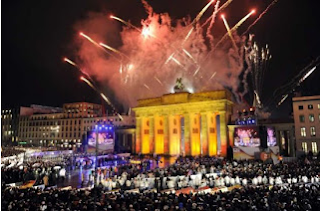 It was the 20th Anniversary of the fall of the Berlin wall. And I thought "What a bloody brilliant time to be at TechEd 2009 ! I could have spent the day in assorted sessions and labs and then headed out to the wall." Instead, I was sat at my desk in Burnley working on an ASP.NET demo when all of a sudden; PING ! I had an email. "Hello from Bob. Your man in Berlin!" One who apparently got to go to TechEd 2009. Found out recently that Adrian came back armed with a free laptop and video camera.